I am trying to compute the yield on the Ultra-Bond Treasury Futures which is roughly 172.2187. U.S. Treasury bonds with remaining term to maturity of not less than 25 years from the first day of the futures contract delivery month. The invoice price equals the futures settlement price times a conversion factor, plus accrued interest. 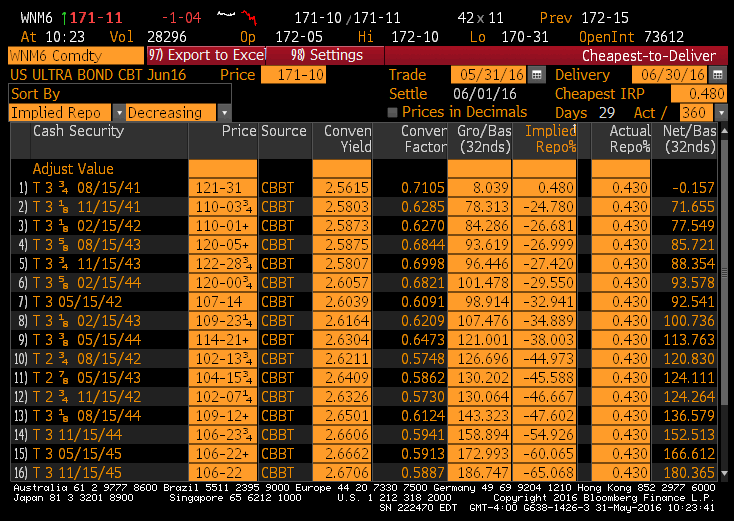 The conversion factor is the price of the delivered bond ($1 par value) to yield 6 percent. When I solve this I get I=-0.0874 %but I am not sure this is correct? I think you have a little misunderstanding about treasury futures. I would get this book: http://www.amazon.com/Treasury-Bond-Basis-Depth-Arbitrageurs/dp/0071456104?ie=UTF8&psc=1&redirect=true&ref_=oh_aui_search_detailpage It is the absolute best guide to this product. Every treasury future has optionality to it because you can deliver one of several securities. There is a conversion factor assigned to each deliverable bond. The CBOT wanted to try to make it as if you are trading a 6% bond and to standardize across all deliverables. The seller of the contract can deliver from the first delivery date to the last. In today's environment that usually means that you will get the bond on the last day since the carry is higher than the price drop of waiting. That means you need to use the last delivery date for your settle date. If you have BBerg enter WNM6 Comdty DLV and you will see the breakdown for the contract and it's deliverables. In general to calculate the equivalent yield you have to look at the conversion factor assigned to each deliverable. There is a formula for it somewhere. I coded it up once upon a time decade ago and most market data services have that implemented as well. In general you will multiply the conversion factor time the price and then use the last settle date for the contract and that will get you the yield. As it is now the ultra has little optionality to it so that will be roughly good enough. For other contracts you will have to figure out the value of the option that the buyer of the contract is giving to the seller that lets them deliver a cheaper note if conditions change. EDIT Added a screen-shot from BBerg. Take a look. You can see it shows that the 8/41 is the cheapest to deliver and that the conversion factor is .7015. Not the answer you're looking for? Browse other questions tagged bond-yields present-value bond-futures treasuries or ask your own question.